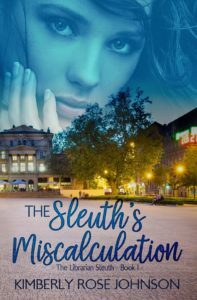 As I visit various blogs to promote my new release, The Sleuth’s Miscalculation, I have noticed that my writing journey has come up several times. It has not only been fun but it’s been eye opening to see how the Lord has encouraged and groomed me over the years. As I look back I see how He put strategic people in my life to encourage and bless me, and bonus He’s allowed me to encourage others which makes me super excited. Here is a quick recap of my career as writer. I worked for six years to get a publisher, then once I had one the line I wrote for closed after my fifth book released. I found a new publisher, then a couple of years lager leapt into indie publishing, and now I both indie publish and write for a publisher. I had so much fun writing this that I already wrote the second book in the series and turned it in four months early! 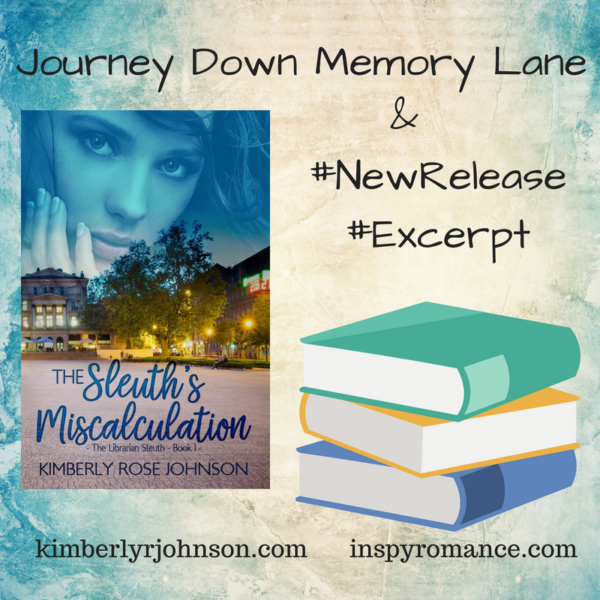 Here’s an excerpt from The Sleuth’s Miscalculation. This is from chapter two and is one of my favorite scenes. Nancy’s eyes widened. This was nuts. She knew Gloria had money, but this was a little over the top. Nancy slipped on flip-flops then thought better of it. If she’d be walking through broken glass, she’d need real shoes. A minute later she ran out the door and slid behind the wheel of her blue Mustang, threw it into gear, and hit the gas. Her tires squealed as she rocketed forward. The car roared beneath her as she screeched around the corner and zipped up the next block. Good thing her mom was the sheriff. Two minutes later, she parked in front of Gloria’s ranch-style house. The Victorian bed and breakfast that the new guy was staying in next door was beautiful. Painted in period-colors and with a wrap- around porch it begged you to come in and sit in one of the old-fashioned rockers. Gloria’s newer home was immaculately landscaped and well-kept, but the Victorian’s grandeur made her friend’s house look dismal in comparison. Nancy hopped out and jogged along the side of the house into the back yard. This was crazy, and she knew it, but she couldn’t leave Gloria to the wrath of ten five-year-olds, or risk little Elsa going to the hospital if she accidentally ate something she was allergic to. She looked around her friend’s perfectly manicured yard. “What exactly am I supposed to break the window with?” The yard was child proof. With a sigh, she ran back to her car, grabbed the towel she kept in the trunk for those just-in-case times, then hustled back to the door. She wrapped the towel around her forearm making sure to cover her elbow with several layers, then with one quick elbow to the pane it broke. Shattering glass smashed to the ground. Carefully, so as to avoid the sharp, jagged edges she reached in and unlocked the door, and then stepped across the glass crunching beneath her sneakers. Cupcakes sat on the counter. All two-dozen decorated in pink frosting with large princess stickers stuck to the paper holders. At the beginning of this post I mentioned how life is constantly changing. The characters in this story deal with that theme quite a bit. How has change affected your life recently? Did you find it to be inspiring or more of a challenge? I would love to connect with you on Facebook. If you’d like to receive my newsletter please visit my website to sign up. Hi Kimberly, this story sounds fun- I love a good mystery, especially with some romance thrown in!! Life has been pretty constant here, but I can definitely resonate with God placing strategic people in my life over the years. It is my prayer that God will use me to be one of those who can bless others and share what He has done for me. That’s a fantastic prayer, Wemble! Hi Kimberly! Enjoyed reading your new release, especially laughed at the scene above. My five star review: Small town atmosphere with quirky, lovable characters and a twist and turn plot makes this mystery romance a hit. The unexpected miscalculations of both the new deputy Carter and sheriff’s daughter made me laugh. Just what the doctor ordered for a whimsical entertaining summer read. Kimberly Rose Johnson’s writing style draws the reader into the suspense. No big changes in our lives. I have been retired from teaching for six years. Everybody is getting older. Hard to believe our oldest son is 40, our oldest grandson will be 13 in August and our Sheltie is 16. One change is probably in my reading. Since I have more time, I explore new authors and new genre. Best wishes and happy writing. I love your review and am so pleased you enjoyed the book! Thank you! Do you mind if I quote you? Kimberly! Any time you would like to quote me, I am honored! On my bucket list is to be published and at this time in life writing reviews and praise paragraphs is one way I am achieving my dream. I’ve had no big changes in my life recently. We moved back to my hometown 2 years ago but I’d always lived within an hour of it, so it wasn’t a huge deal. Your new book sounds fantastic. I just borrowed in through Kindle Unlimited so I’ll be reading it soon. Wahoo, a repeat kind of book. Thanks! I’m looking forward to reading your new release. It’s on my TBR list. I’ve enjoyed all the books of yours which I’ve read. You have a fun, fresh way of writing, and it also helps that your stories take place in places dear to me. FUN FUN! The only real changes in our lives right now are grandbabies. We now have two and it’s been fun to see them grow. Neither one is walking yet, but soon. We’ve also realized we need to reorganize our house so little hands don’t destruct and destroy. However, I won’t have it any other way. Ah grand babies. So precious. I’ve noticed via your FB posts you’ve been doing some remodeling. I hope it’s going smoothly. We remodeled our bathrooms about a year-and-a-half ago. I’m so glad we did it, but I didn’t enjoy the process. Sounds like a fun book. I’ve read a lot of yours and have enjoyed them. One recent change in my life has been getting involved in CERT – Community Emergency Response Teams. My husband and I are meeting a lot of neighbors who are not believers, and keep praying for ways to show Jesus’ love to them. Thanks, Margaret! What a great thing to do! I imagine CERT will provide many opportunities to show Jesus’s life be. We are facing more health issues (so are our relatives), but God is always with us. Enjoyed your post very much. Your books sound very good….since I am avid reader I will be checking into them! Thank you , Jackie! I’m sorry to hear about the health issues. That’s funny, Kimberly. I started out trying to write Romantic Suspense too. I guess because I’ve always watched a lot of detective shows. But I kept solving the suspense early and concentrating on the romance. A writer friend told me I should try straight romance and then I went to a writers conference where the speaker said you should probably write what you read most. Duh, I’ve always read sweet or inspirational romance. We’ve had a busy few weeks, and I hate that I still haven’t read this new book! Love the excerpt, and I know it will be fun to read! I’ve had a big change the last 6 months, or actually almost a year now. Most of the time I can no longer find time to read a book or 2 a day, but I know my faith has grown tremendously, as we’ve seen God guide us. Ah yes, change has a way of drawing us closer to Him as well as cut into that precious reading time. Thank you for sharing your writing journey, Kimberly!